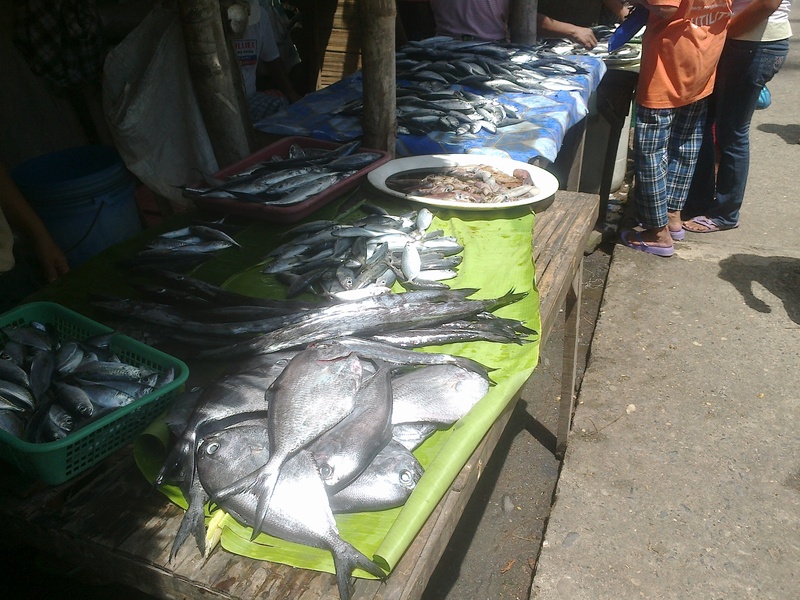 Every Wednesday the nearby town of Zamboangita comes alive with Malatapay Market, the well-known, outdoor market that takes place only one day per week. 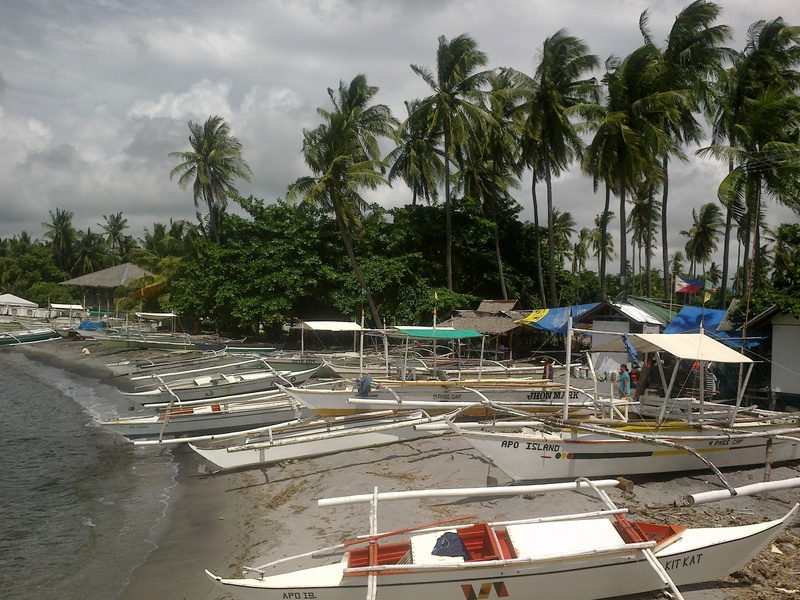 Located just off the National Highway, it’s about a 25‑minute ride from Dumaguete. 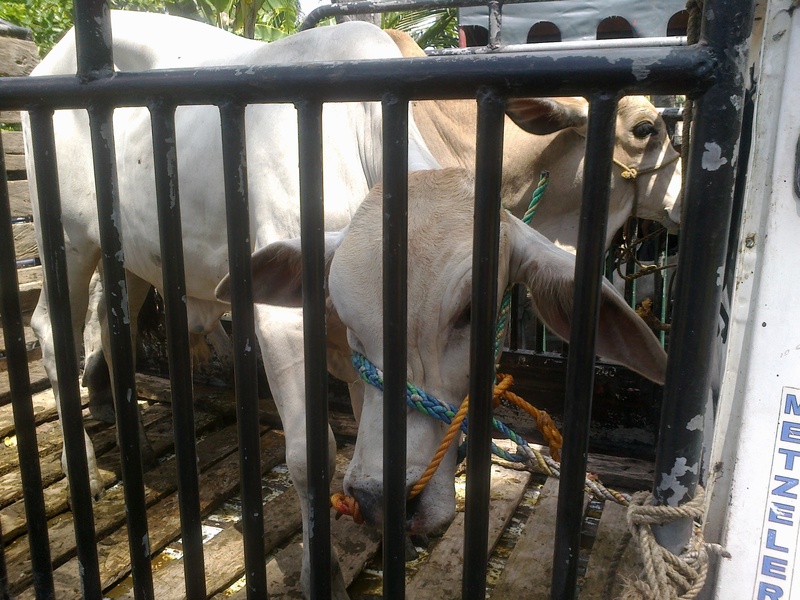 I visited the Market for the second time just a couple of weeks ago with my friends, Edna and Rhiza, riding the Ceres Bus from Dumaguete (P25 each). We knew we’d arrived when we saw all of the fruit and vegetable stands and many motorbikes parked along the highway. 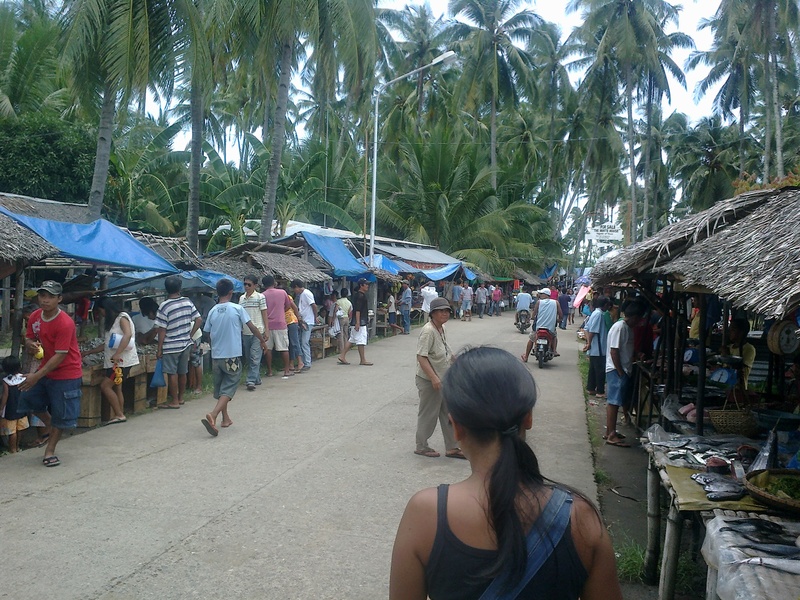 The Market begins at the National Highway and runs down a side road all the way to the sea. 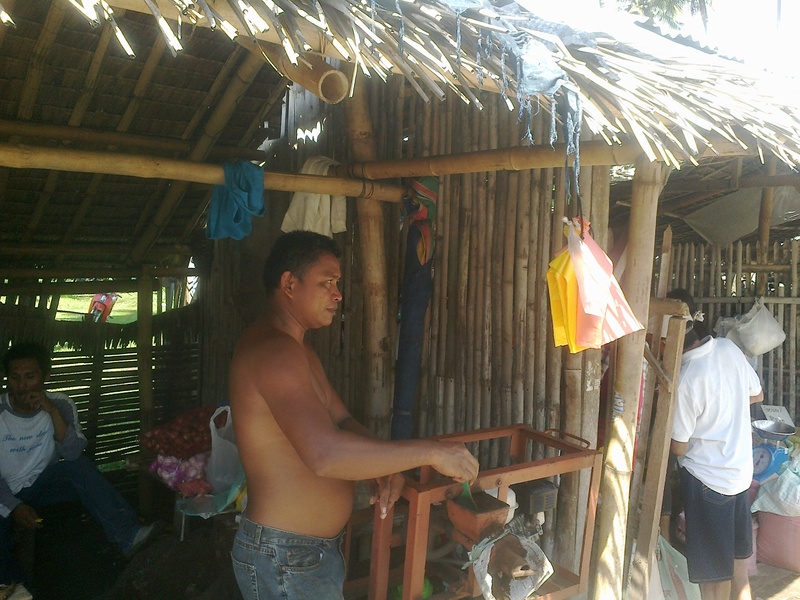 Local vendors set up stands on both sides of this small road, selling home-grown fruits and vegetables, tobacco, chicken, meat, pork and “freshly-caught” seafood. One man, using a homemade grinder, was selling his fresh-ground coffee by the kilo. 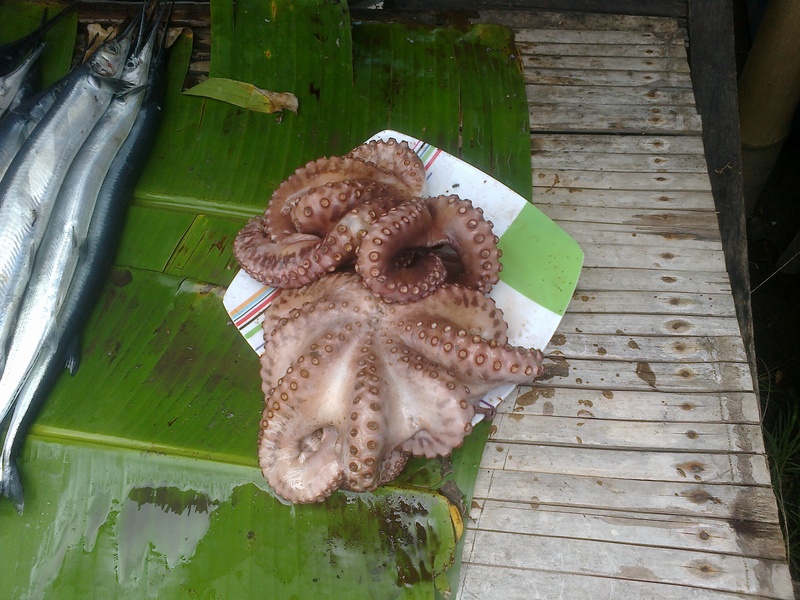 I was overwhelmed by the variety of seafood – everything from octopus and very large squid to assorted fish and crabs. All around us people were bartering for the best price, purchases were weighed and bagged, and money was constantly changing hands. Many native crafts were displayed, including jewellery, artwork and wind chimes (I purchased a beautiful set of chimes to hang at our front door). Still more vendors arranged tables underneath large tents selling plastic storage containers, an assortment of glassware and dishes, tools, pots & pans and cooking utensils. 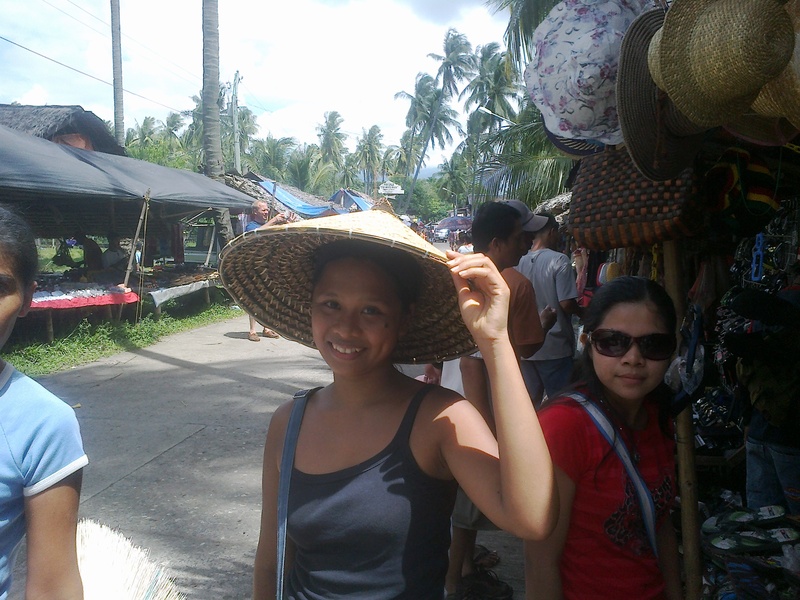 I tried - unsuccessfully - to convince Rhiza to buy this hat! There were racks of T-shirts, shorts, dresses, hats and baby clothes; tables full of slippers (what we call “flip‑flops” in the United States), watches, key chains, wallets and sunglasses. A number of extremely persistent young men were walking around selling both loose and stringed pearls. Reaching the end of the road, we walked out past the boat houses to the sea. It was a beautiful day allowing for a clear view of nearby Apo Island, a famous spot for diving enthusiasts. Boats were lined up all along the beach, and we watched a couple of boys snorkeling just off the shore. 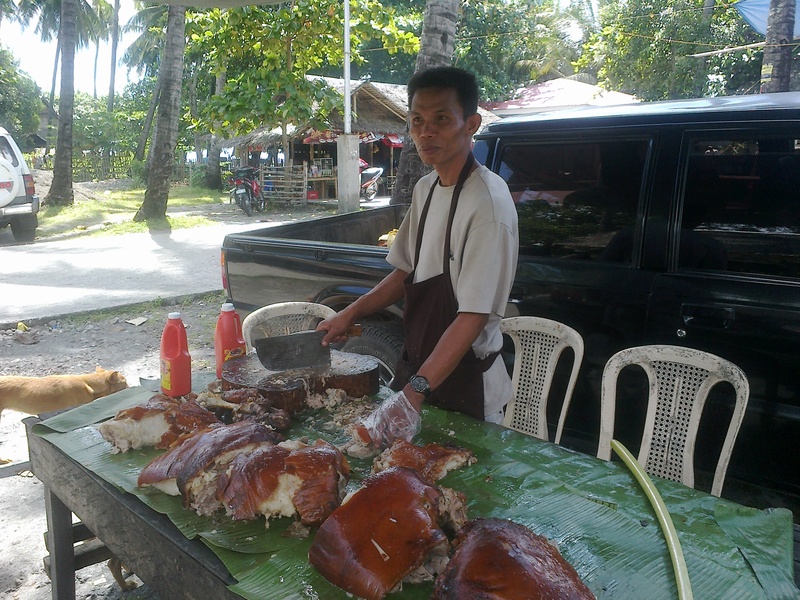 Heading back to the road, we saw two large tables with cooks serving the Filipino specialty, lechon. Lechon is roasted pig and is the centerpiece to all major Filipino celebrations, from fiestas to weddings, graduations, baptisms, etc. Anthony Bourdain himself has proclaimed that the best lechon he has ever tasted was here in the Philippines. I spoke with the cook, asked if I could take his picture, and then requested he chop and bag up a kilo (including a generous amount of the popular, crispy skin, which my husband loves!) to bring home. We noticed a crowd across the road and went to see what was happening. 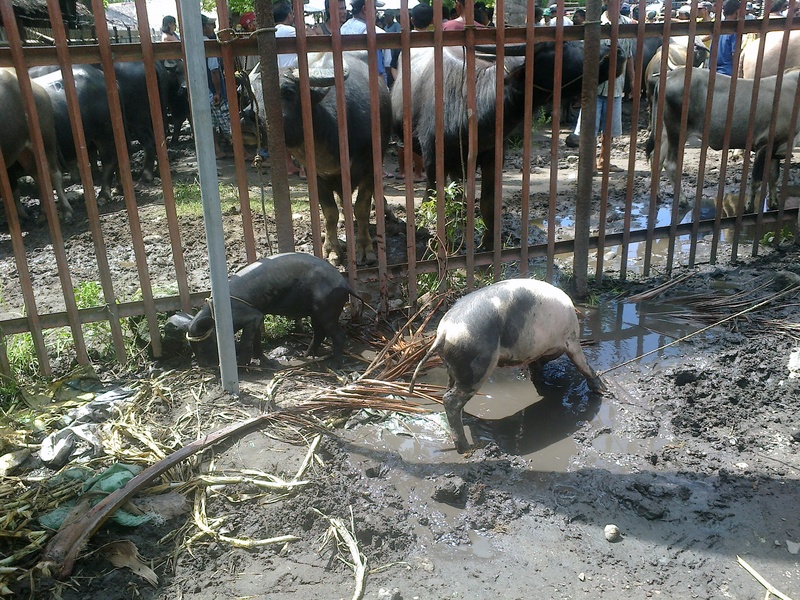 It was an “auction” pen, where people were selling and buying livestock, from caribou to pigs, goats and chickens. We continued down the road, stopping to purchase tomatoes, avocados, green beans, mangoes and bananas. The prices were just incredible, and we each came home with bags of gorgeous fresh fruits and vegetables (along with my kilo of lechon and a set of wind chimes!). 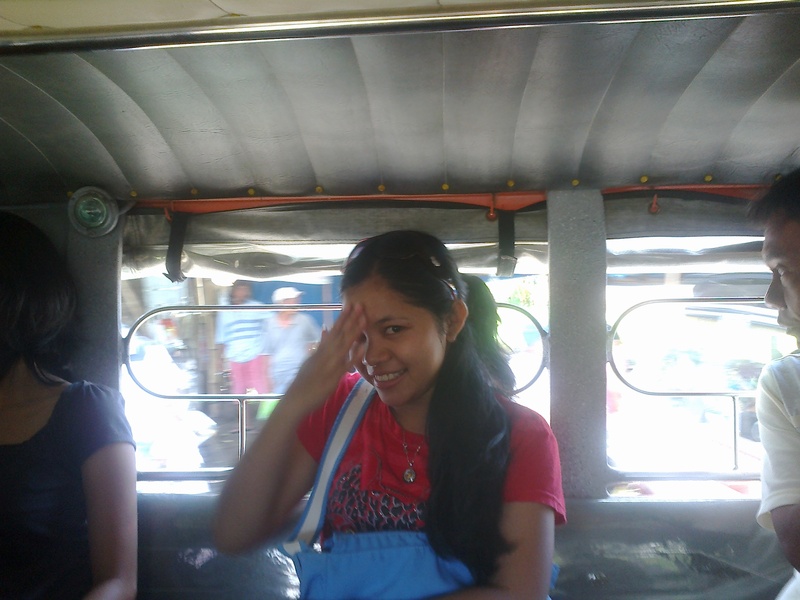 Our driver let us out in downtown Dumaguete, where we hailed a trike and were back in Barangay Daro by about 2:30pm. We had a terrific time and plan to make it a monthly event. 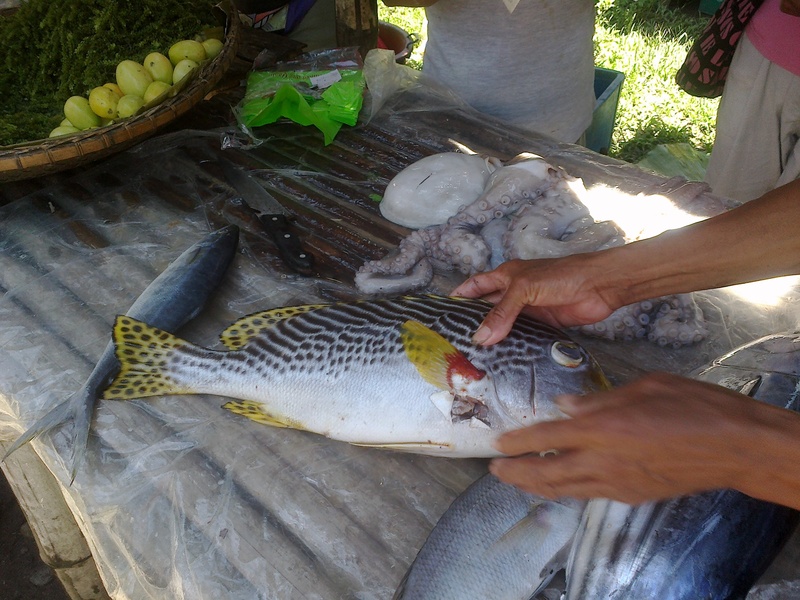 I highly recommend a stop at the Market for anyone that visits Dumaguete!